The number of smartwatches on the market is higher than ever before, but how many of those smartwatches are actually worth buying is a very different question. With the earliest incarnations, you got weird features like a spy camera on the wrist strap and chunky exposed screws, all atop a bespoke and not-all-that-good operating system. Do we really need a camera on our wrists? It seems not. Then came Android Wear and some circular devices, suggesting to the potential smartwatch-buying public that perhaps technology doesn’t have to come at the expense of fashion. Then came the Apple Watch, which quickly became the most popular smartwatch on the market – no doubt helped along by the wide variety of different finishes and straps on offer. But then Apple’s a totally different platform, ultimately, if that’s the ecosystem you splash around in, you’d probably be better off with an Apple Watch. For everyone else, it’s a more disparate picture – there are second-gen wearables from companies like Motorola and Samsung, and completely independent smaller manufacturers making slightly more activity-oriented devices. Amid this fractured scene, Huawei decided the Android Wear market needed a contender that prides itself on fashion – and it’s not wrong, the first generation Moto 360 wasn’t the most graceful of devices. A flat tire, in fact, is what it came to be known as. Over the last couple of years, I’ve been lucky enough to test a few different watches, including the Original Gear, Moto 360, the Tizen-based Gear S2 Classic and a few others. The Huawei Watch actually arrived at about the same time as the Gear S2 Classic, and as such has had to vie for wrist-time. The Huawei model I looked at was also the ‘Classic’ but there’s an ‘Active’ and ‘Elite’ edition too. Huawei is clearly pitching its Watch on aesthetic appeal. If you were in any doubt as to this, Huawei removes that with an embroidered line in the lid of the box – itself a more traditional looking jewellery/watch box-type arrangement than any other wearable I’ve seen. The version I looked at had a leather strap, rather than a rubber or metal band, as has been found on other devices. This undoubtedly helps it to feel like more of a normal watch than a futuristic smartwatch but posed its own issues. “The Huawei Watch is the smart timepiece choice for anyone living in the modern world,” is another of the company’s lines. You’re not just getting any old smartwatch, people, you’re making a definitive choice about a contemporary timepiece. There’s a whole range of different straps (leather, stainless steel link strap or stainless steel mesh strap) and a “multitude” of color options to keep things interesting. The face uses a 1.4-inch (400 x 400 pixels) piece of circular sapphire glass – the sort you’d find on a regular watch – and you can (of course) customize the watch face via the Android Wear OS. The metal watch unit itself is a polished cold-forged stainless steel affair that measures 42mm in diameter and 11.3mm in depth. The Watch comes with a few different customizable options, but all use the same slightly-too-thick 11.3mm deep watch unit. The result of this is that it’s a bit too chunky for many people to wear – I wouldn’t in the long term, and certainly think that many women would also be put off by the heft. 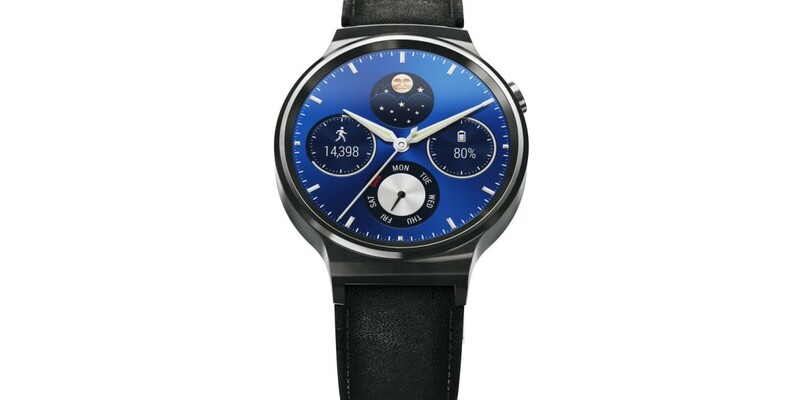 Pair this with the fact that the user experience of all Android Wear watches are virtually the same, and all the Huawei Watch is left to trade on is its price and its looks – and with a starting price of $349 (£299), it doesn’t quite reach the expectation bar that it sets for itself. It might seem like a strange complaint, but I also found the leather-strapped version to be disconcertingly light. I like a premium, expensive product to convey that sense of quality through its design, and while Huawei’s has a go at this, it isn’t altogether successful. Admittedly, a more expensive version with a metal mesh or strap band would add to the weight and fix that a little, but then you’d have to spend even more money. It’s ‘nouveau riche’ when what it wants to be is ‘old money,’ and as a result it fails to deliver that feeling of class. Comparing it with something like the Samsung Gear S2 Classic only highlights this further for me – the Samsung brought back classic watch design but added truly useful functionality by allowing you to control it with the rotating bezel. There’s nothing wrong with the Huawei Watch – from my limited use of it, it performs as well as any other Android Wear device (and its display is particularly nice), but what it’s trying to be is a fashion statement, and on those terms it misses the bar for me. It’s still one of the nicest design options available running Android Wear, but the ‘Classic’ and ‘Active’ versions being among the best of a limited choice doesn’t speak that well of them, or the market as a whole. The only version I’d consider wearing in the long term is the ‘Elite’ model, which has a far nicer looking bezel, but it’s not one I’d ever consider spending the money on.